Admit it…we’ve all been guilty of over sharpening. I’ve notice that not only do people tend to over sharpen, but they tend to sharpen the whole image. 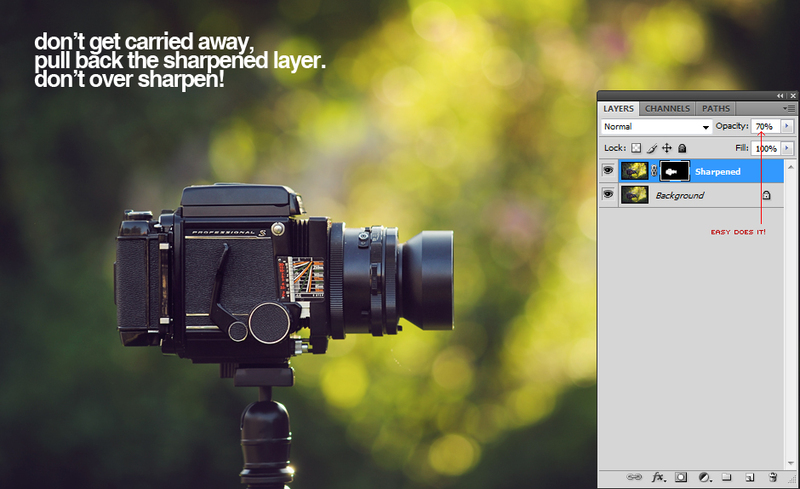 In this guide I will show you how to use layer masks to sharpen only selected areas. This technique of using masks can not only be applied to just sharpening but any adjustments. Step 2: Sharpen your image (Use any method you want). 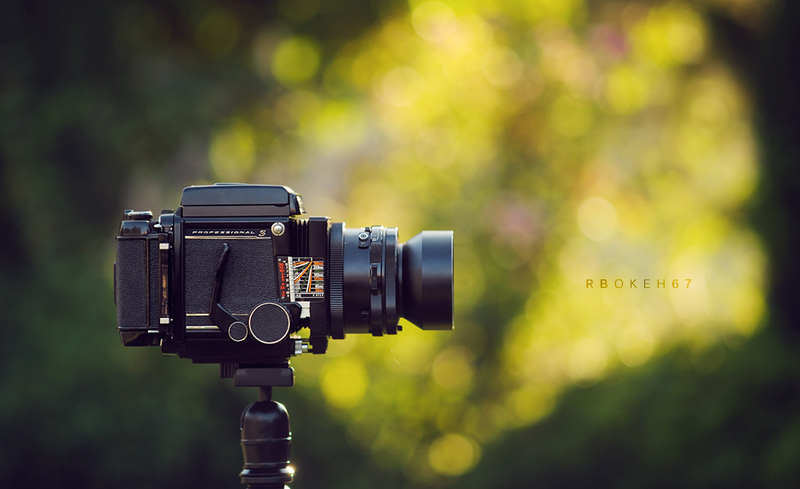 Notice how un-smooth and ugly the bokeh gets! This is not good! Step 3: In the layers window..press the the layer mask button to add one. Notice that nothing happened to the image. Step 5: Select your brush and the color white. Make sure the layer mask is selected. Now paint the areas you want sharpened. At this point the camera will be sharpened and the background should stay in it’s original state. Step 4: Not so fast! That camera at this point is most likely still over sharpened. By adjusting the opacity you can fine tune the sharpness you want. Step 5: You are done! Remember, this technique can be used for any adjustment (brightness, contrast, colors…ect). Keep the small tips comming, there are a lot of people that dont use mask. Fantastic. Great new blog! Definitely bookmarking – I’ll be back. I’m used to erring on the side of fuzziness, because I hate the over-sharpened look. But thanks to your useful tutorial, no longer! Nice & cute ,’;o]… Simple too! Digging your style, glad it wasn’t to drawn out as my attention span for Pp isn’t what it should be, LMBO. I won’t lie Ed, I have never understood layer masking and I’ve never used it before. This is probably the 5th time it was explained to me and I finally get it!! Thank you! It’s so simple. I do essentially the exact same thing in a different way to edit, but this is much cleaner. Glad to see the first post about PP! The shortcut you talked about is CTRL+I with the mask selected. This is a very easy tutorial but for more difficult ones you can consider making short videos or something. Just an idea. lol…. i like your first comment of give up now if your confused. What if one uses Lightroom only? If you use lightroom you can paint the area of desired sharpness with the adjustment brush (after generally adjusting the sharpness in the detail section). That’s true, Mister Admin. However, I would add that if you wanted to do more things to the image, I’d rather do it all in Photoshop because of the layers. I might change my mind later while I process the image. Maybe I wanted to soften the background initially and then changed my mind. I could then just delete that layer. This is a great tutorial by the way. I wish someone spelled all this out to me with this level of clarity last year when I started working with masks and layers. It took me a few weeks figuring this stuff out. You’re the man Ed. You showed me how to do all of this at the studio the other day, and I went home and forgot how to do it because I didn’t take notes. Now I’m all set! Hi there. Great blog you have here. The command to apply the layer directly on black is press ALT+button add layer mask. This way, you only have to select white brush and paint it. Or, even more simple, select directly the opacity you want, like 70% for eg. and paint it white, and you’re done, with a few less clicks. Cool. Really effective and you make it look simple! Thanks. Right on. Using layer masks is probably one of the best techniques for post processing images and as you stated, can be used for all sorts of adjustments. One that I really like is turning a duplicate layer to screen mode, hiding it with a mask, then selectively painting in the dark areas to lighten them, if you've got a wacom tablet, all the better. Love your work and thanks for sharing. Thanks a lot, it's a “simple” idea but very helpful. I just started using unsharp mask and did quite over-sharpen many photos trying to get the most out of a small digital picture frame, this method makes a great difference! I love your writing style already. I'll definitely be a regular here. Your step by step is so fantastic! Thanks for sharing this! can you please do a tutorial on how you bring out colour and detail? you are amazing at that! Thanks for starting a blog. I'll be a frequent visitor! wow! that's really great, real simple. Thanks for the walkthrough. This is awesome.. Thanks for sharing! Great article Ed! And the keyboard shortcut for filling a mask (or a layer) with your foreground colour is Alt + Backspace and for filling with background colour Ctrl + Backspace. I would really appreciate it if you would find time to do a PP tutorial on one of the images you did back during your PP Fridays, for example:Time & Tide, A New Dawn, Lothlorien or A Small Farm in the country of Florin. For example, and to be more specific, how did you accentuate the thin waves in Time & Tide and made the rocks stand out, or how did you paint the sky and not make it too obvious, etc. Thanks! I found this blog easy to learn and fun to read. Keep up the great work. It really helps us Photoshop challenged types. Nice write-up Ed. 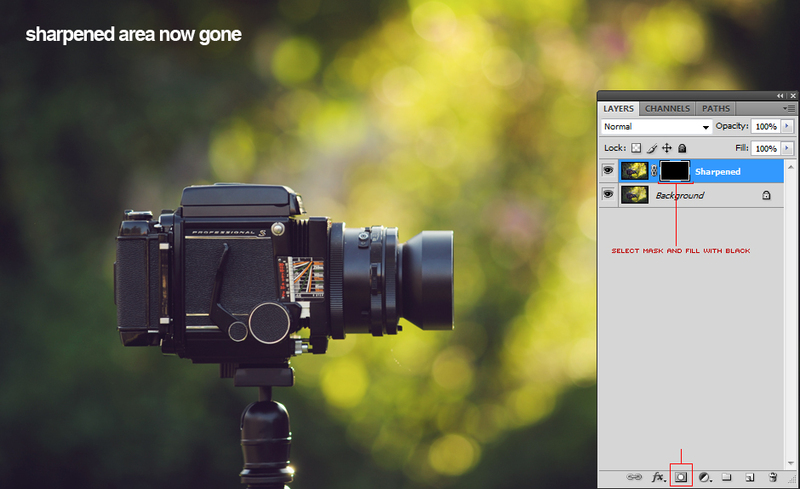 This is a great series for photographers that are just starting to find their way in Photoshop. One little tip I learned recently: you can create the layer mask pre-filled with black by holding down the alt/option key when you click the little mask icon. Wow! Thanks so much for sharing!! I am a totally newbie for PP. It’s so easy to follow!!! Your step is too good. Spend my time frequently enjoyable keep up with your great performance.